Strong growth in both emerging and traditional markets takes Bentley above 10,000 units for the first time. With retail sales of 10,014 units worldwide, Bentley has completed the best year in its history. Overall volume grew by 7%, with increases in almost all major markets: +7% in the UK, +4% in North America, +7% in Europe, +18% in the Asia Pacific region and +93% in China alone. In the UK, a record 2,079 units were sold in all. In North America, a figure of 4,196 units was achieved, despite the prevailing economic climate and a new record was set in continental Europe with 2,166 units. In China, the final sales number was 338 units. In South Korea, 100 cars were sold in the first year in that market. These excellent results were buoyed by growth across both the Arnage and Continental ranges. Thanks to the introduction of the Azure convertible, sales grew by 44% in the Arnage line and with the GTC convertible enjoying its first full year in the market, 2 door Continental sales increased by 57%. "These results are a milestone for Bentley, which has strengthened its presence around the world, in both emerging and established markets" said Stuart McCullough, Bentley's Member of the Board, Sales and Marketing. "A major component of this is our export business, with overseas income in excess of £745 million. Bentley is proud to be a leading British vehicle manufacturer, with all of its production based in Crewe, a workforce of 3,800 and a 500 strong engineering team, making it a significant employer in the North West. With its combination of modern technology, craftsmanship and bespoke capabilities, Bentley occupies a leading position in the luxury vehicle market and expects to maintain that position into the future." 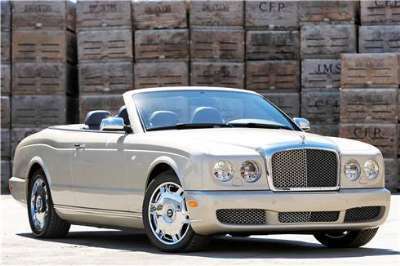 In Australia, Bentley sold an amazing 127 units during 2007, up 17.6% over the 2006 result when 108 units were sold.